Screenwriters have always been viewed as Hollywood’s stepchildren. Silent-film comedy pioneer Mack Sennett forbade his screenwriters from writing anything down, for fear they’d get inflated ideas about themselves as creative artists. The great midcentury director John Ford was known to answer studio executives’ complaints that he was behind schedule by tearing a handful of random pages from his script and tossing them over his shoulder. And Ken Russell was so contemptuous of Paddy Chayefsky’s screenplay for Altered States that Chayefsky insisted on having his name removed from the credits. Of course, popular impressions aside, screenwriters have been central to moviemaking since the first motion picture audiences got past the sheer novelty of seeing pictures that moved at all. Soon they wanted to know: What happens next? In this truly fresh perspective on the movies, veteran Oscar-winning screenwriter Marc Norman gives us the first comprehensive history of the men and women who have answered that question, from Anita Loos, the highest-paid screenwriter of her day, to Robert Towne, Quentin Tarantino, Charlie Kaufman, and other paradigm-busting talents reimagining movies for the new century. The whole rich story is here: Herman Mankiewicz and the telegram he sent from Hollywood to his friend Ben Hecht in New York: “Millions are to be grabbed out here and your only competition is idiots.” The unlikely sojourns of F. Scott Fitzgerald and William Faulkner as Hollywood screenwriters. The imposition of the Production Code in the early 1930s and the ingenious attempts of screenwriters to outwit the censors. How the script for Casablanca, “a disaster from start to finish,” based on what James Agee judged to be “one of the world’s worst plays,” took shape in a chaotic frenzy of writing and rewriting—and how one of the most famous denouements in motion picture history wasn’t scripted until a week after the last scheduled day of shooting—because they had to end the movie somehow. Norman explores the dark days of the Hollywood blacklist that devastated and divided Hollywood’s screenwriting community. He charts the rise of the writer-director in the early 1970s with names like Coppola, Lucas, and Allen and the disaster of Michael Cimino’s Heaven’s Gate that led the studios to retake control. He offers priceless portraits of the young William Hurt, Steven Spielberg, and Steven Soderbergh. 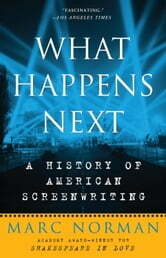 And he describes the scare of 2005 when new technologies seemed to dry up the audience for movies, and the industry—along with its screenwriters—faced the necessity of reinventing itself as it had done before in the face of sound recording, color, widescreen, television, and other technological revolutions. Impeccably researched, erudite, and filled with unforgettable stories of the too often overlooked, maligned, and abused men and women who devised the ideas that others brought to life in action and words on-screen, this is a unique and engrossing history of the quintessential art form of our time.